TAOISEACH ENDA KENNY has told his party that Ireland’s best days are ahead as he tonight committed the government to a target of having replaced all the jobs lost during the economic crisis within the next six years. In a keynote speech to delegates at the Fine Gael Ard Fheis in Dublin tonight, Kenny said that the government will have a “relentless focus on job creation” in 2014 and that the aim is to bring unemployment below 6 per cent by 2020. He also pledged to bring unemployment below the eurozone average of 12 per cent before the end of this year and to eliminate the budget deficit entirely by 2018. In a speech quoting both Albert Einstein and Abraham Lincoln, Kenny also promised legislation to establish a €6 billion Strategic Investment Fund in the coming weeks and said an agreement is nearly concluded with German bank KfW to secure funding for Irish businesses. Kenny also said that his party in government will not allow the institutions of law and order to be undermined by recent controversies, saying that his only interest in the recent Garda Ombudsman and garda whistleblower controversies is “public interest and the truth”. The Taoiseach also said that every Fine Gael local election candidate is is committed to “opposing any increases in commercial rates or local property taxes” if elected to serve on local authorities in May. I want to talk to you tonight about where we are now as a country. And to outline the next steps we will take to move Ireland towards a brighter future. Three years ago, this country was in crisis. The public finances were out of control. Jobs were hemorrhaging from the economy. Ireland’s international reputation was in shreds. In the face of that crisis, the Irish people gave Fine Gael and the Labour Party a strong mandate to fix the public finances, and get Ireland working again. Since then we have worked night and day, implementing a clear plan, to fulfil that mandate. We haven’t got it right on every issue but, crucially, we have made real progress. Last December, Ireland became the first Euro country to exit a bailout programme. We took our place again as a full and respected member of the Eurozone. The credit for this achievement rightly belongs to you the Irish people. You have been patient and shown remarkable resilience throughout the crisis. I thank you for your contribution to our country’s recovery. Exiting the bailout doesn’t mean our problems are over. But it was an important step in the right direction. It enhanced our international reputation. It will ensure that investors will continue to choose Ireland. To ensure that Ireland remains strong in Europe, it’s more important than ever that we elect strong Irish members of the European Parliament in May. The Fine Gael team – Brian Hayes in Dublin; Jim Higgins and Mairead McGuinness in Midlands/North-West; and Deirdre Clune, Simon Harris and Sean Kelly in the South – have the ability, experience and strength to fight for Irish interests in the European Parliament. But the end of the bailout is not an end in itself – we must use it to create a sustainable economic recovery. More jobs, better living standards. Yes, Ireland is moving in the right direction, but I acknowledge that many people do not yet feel any improvement in their daily lives. I know that many of the measures we have had to take have been very painful for families, and for individuals. For many of you watching tonight, life is a struggle to make ends meet. You’ve made huge sacrifices over the last three years. Let me tell you those sacrifices won’t be wasted. Well, we had a clear plan to stabilise the economy and exit the bailout. Now, we have a clear plan to rebuild our economy after the bailout – to keep up that momentum. A clear plan to use our economic freedom to create a strong and sustainable economy for the future. This is a plan based on enterprise, not on speculation. I want you to know we are never going back to the culture that almost destroyed our country. That is why, we will now implement our strategy for growth with the same focus and determination as we did to exit the bailout programme. At the heart of our plan is the creation of jobs for our people. The official figures published this week, confirm over 60,000 net new jobs last year. Two thirds of these in new companies. Over 1,000 jobs each week. That’s a solid start, but now we must do more. Unemployment is falling, but it’s still far too high. Too many are leaving the country, and the families they love to find work. I want our young people to have the opportunity to live and work in their own country. We are making steady progress. Employment levels are now growing. I can confirm to you this evening that we are on track to get the unemployment rate down to below the Eurozone average before the end of this year, and to below 10% by 2016. That’s why the Government designated 2014 as a year of relentless focus on job creation. full-time jobs to the economy in the lifetime of this Government, and, by 2020, to replace all of the 330,000 jobs lost during the economic crisis. This will bring the unemployment rate to below 6%. These are challenging targets, but they are achievable. The achievement of these jobs targets is based on 3 pillars. We must continue to manage our public spending prudently. We all know that, in our daily lives, you can’t keep spending more than you are earning. It’s just not sustainable. Tackling the huge gap between government spending and income has been crucial to exiting the bailout. It is essential for continued investment. Over 90% of the necessary tax measures and spending cuts to bring our public finances under control have already been implemented. We must and will complete this job by cutting the budget deficit to 3% by 2015; and eliminating it entirely by 2018. I know that these measures have imposed burdens on the finances of families. That’s why we will continue to deliver on our promise not to increase income tax, and, when the public finances allow, our priority will be to reduce the tax burden on families with average incomes, too many of whom are paying the high rate of tax. The Irish banks have been stabilised, but much more needs to be done. They have been a huge drain on the country for the last five years, but now they must support recovery in the real economy. They must become part of the solution, rather than the problem. businesses – the lifeblood of our economy – to allow them to grow and create jobs. We are also making new sources of funding available to support the creation of jobs. In the coming weeks, legislation will be published to establish the €6 billion Strategic Investment Fund. We are also concluding an agreement with Germany to secure significant new funding for Irish businesses from the German state bank KfW. The banks must also do more to help people who are in mortgage arrears. That’s why we will require the banks to make sustainable offers to every family in mortgage distress by the end of this year. We want people to keep their family homes. Repossession must be only the very last resort. Thirdly; rebuilding the domestic economy. Since 2011, economic recovery has been largely driven by investment from multi-national firms and exports. Central to that recovery has been Ireland’s 12.5% corporate tax rate, which will remain in place. Now, we will focus more intensively on the domestic economy, particularly on the sectors where most jobs can be created. Our new Action Plan for Jobs for 2014 creates that focus. At its core, is support for Irish entrepreneurs and smaller Irish companies to improve and expand their businesses, and increase their exports. We must ensure that job creation reaches every part of the country. job creation at local level, particularly in areas like the retail sector where commercial rates can be a huge burden. In May, the people will elect new members of the radically-reformed local government system. Whoever you elect will have new and real power to determine local charges. Fine Gael will stand more than 450 men and women of quality and integrity in these elections. Every one of them is committed to supporting their local economies by opposing any increases in commercial rates or local property taxes. Over the coming months, 31 new Local Enterprise Offices will be established throughout the country to provide advice and support to people starting businesses at local level. One home grown industry that has led the way, has been our agri-food and fisheries industry. Exports have increased by nearly 20% in the past three years as the global demand for high quality food and drink continues. Ireland has a reputation for producing the finest food and drink in the world. Last year we secured market access to Japan, Singapore, Egypt, Lebanon and Iran for premium Irish beef. We are now working towards gaining access to the US, Canada and Chinese market. to significantly increase our global dairy sales with new investment around the country. We estimate that 25,000 extra new jobs can be created in this sector in the next seven years. During the property boom, the construction sector grew too large and the country became dangerously reliant on it. But now this sector is too small for the needs of a growing economy. Over 90,000 people who worked in construction are still on the live register. I want to get these people back to work. Supporting the development of a new construction industry based on the highest international standards in quality is essential. high quality office space for companies or building vital infrastructure like tele-communications, water and energy networks. It also provides the homes that families need, particularly for young families. But the industry has to maintain the highest standards in quality if it is to regain the trust of the people. It must step up to the mark. Because we will not tolerate any more Priory Hall’s or pyrite housing estates. We are now finalising a new strategy for this sector. In the last Budget, we introduced a Home Renovation Incentive which offers tax relief for people who renovate or improve the energy efficiency of their homes between now and the end of next year. Further initiatives will include incentives to develop vacant sites; better planning for future housing needs in urban areas; and new building control regulations. We also plan to expand the tourism sector. Last year, The Gathering was a huge success. Not only did it bring at least a quarter of a million extra visitors into the country in 2013, spending €170 million, it was also the catalyst for over 5,000 events throughout the country. These events, in every corner of Ireland, displayed the Irish community spirit at its very best – people worked together to create projects and events to bring our diaspora home. Tonight, I want to thank the tens of thousands of people, most of them volunteers, who gave of their time in this great national effort, and for making our visitors so welcome. I want to ensure that we build on that success. The measures we have already taken – like cutting the VAT rate on tourism services – have already helped create over 22,000 new jobs. In the last Budget we abolished the travel tax which will means many new air routes will bring thousands of extra tourists into Ireland this year. Our new tourism strategy will build on this progress over the next decade. As more jobs are being created, we must ensure that these jobs can be taken up by unemployed people. We have to make sure that a man or woman without a job knows that they’ll be better off financially in work. Too often, it does not make financial sense for families to take up work because they will lose all of their welfare benefits. One such welfare trap is the Rent Supplement Payment which people lose if they are no longer unemployed. This year, we will implement the biggest reform in housing supports in a generation. By replacing the rent supplement with a new Housing Assistance Payment, we will ensure that 34,000 families will be better off in work. But the wellbeing of our people depends also on justice and security within the State. You all know of the recent events regarding An Garda Siochana and the Garda Ombudsman Commission. Public confidence in our justice system is critical. In recent weeks, a number of developments have served to weaken that confidence both in our police force, and the body tasked to oversee it. Fine Gael in Government will not allow these important institutions to be undermined in the eyes of the Irish people. Our only interest is the public interest and the truth. That means having a Garda force that commands the respect of the public. That means having an Ombudsman Commission with the right structures to provide effective and independent oversight. The Government has taken a number of important decisions to restore public confidence in both institutions. I believe these actions to be both appropriate and responsible. Any further action that is recommended will be taken. The safety and security of our people are paramount. Anyone who has tried to play politics with these issues should hang their heads in shame. This is the start of Seachtain na Gaeilge when we begin our St. Patrick’s celebrations. In honour of Ireland and the Irish of this and every generation, the world our ‘blue planet’ will go green. In the year of the Gathering people came ‘home’ to Ireland in their hundreds of thousands. They discovered a people of courage a country in recovery the rise of a new confidence. They saw that just three years since we took Office, Ireland is indeed emerging from its long, difficult Winter, turning its face once more towards higher ground and better days. In recent weeks nature’s winds and waves exposed just who we are. Men and women went door to door or shore to shore in boats and with horses to rescue neighbours marooned in their homes. These Gatherings in commuities all over the country, epitomise the real Irish spirit, the real power of community, and the real meaning of helping one’s neighbours. Let us continue to believe in ourselves and have hope in our future. And you have every reason to do so. Because at long last, the tide has turned. At long last, the economy is recovering. And we are working day and night to make sure that soon, very soon, you will start to see the results of this growing success, above all in jobs, in work to go to. A time for leadership, a time for confidence and courage, a time for everybody to rise to our national challenge of rebuilding our economy and providing jobs for our people. And just as we do in arts, in literature, in sport, in music and culture, as our young continue to change the digital frontiers up ahead and give opportunities for creative minds to make their mark. I know that when the Irish apply themselves to a task, we are unbeatable. ‘The key to life’s coming attractions’. And on this ancient island, in this still-young Republic, we must dare to believe, dare to imagine. Because for Ireland, our best days are up ahead. “I am not bound to win. I am not bound to succeed. But I am bound to live up to what life I have”. That’s my commitment to you. Email “Enda Kenny tells Fine Gael: 'For Ireland, our best days are up ahead' ”. 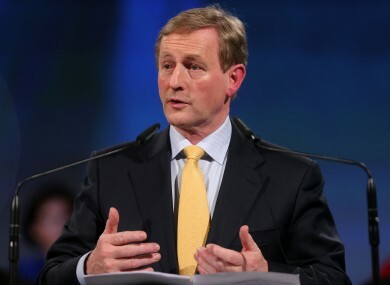 Feedback on “Enda Kenny tells Fine Gael: 'For Ireland, our best days are up ahead' ”.